Author: Dr. Donald D. Gray, Ph.D.
-> Emphasis on the head concept throughout the text. -> Emphasis on the importance and limitations of the parallel flow assumption, based on the Euler equation in natural coordinates. -> Development of the conservation equations using the easily understood balance principle rather than the needlessly abstract Reynolds Transport Theorem. -> Careful distinction between the ideal Bernouli equation and the mechanical energy equation with loss terms. -> Use of the total and piezometric head lines for the qualitative analysis of pipe flows. -> Use of the latest Crane techniques for minor losses in pipe flows. -> Clarification of when to use gage pressure or absolute pressure in the momentum equation. -> Use of three-dimensional specific head function plots to explain alternate and critical depths in open channels. -> Explanation of when the Manning equation is valid and when the friction factor method must be used in open channel computations. -> Use of the easily understood Ipsen method for dimensional analysis. -> Interpretation of dimensionless numbers as time ratios as well as the traditional force ratios. -> Chapter on physical hydraulic models, including distorted models. -> The book contains many examples worked in detail as well as numerous homework problems, some requiring the use of the computer. A solutions manual is available to instructors. "A civil engineering student who reads this textbook in his or her first course in fluid mechanics will indeed find it readabale and exciting." and "This book is also to be recommended for teaching fluid mechanics for civil engineers." "Overall, Gray's text is a welcome addition to a civil engineering faculty member's bookshelf. Students will appreciate the easy-to-read style with civil engineering applications." 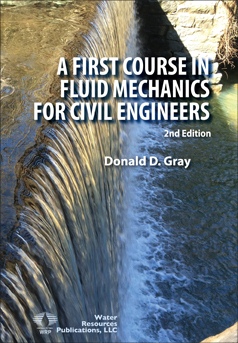 If you are planning to teach an introductory course in fluid mechanics for civil engineering students we invite you to consider this book. To request an examination copy either send a request on your university letterhead to WRP, P.O. Box 630026, Highlands Ranch, Colorado 80163-0026 or fax it to 720-873-0173. Second Edition 2016 WRP.